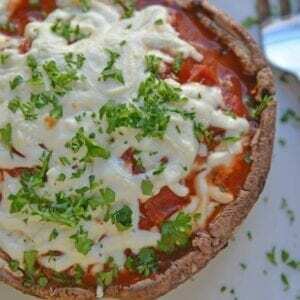 This Quick Portabella Pizza is the ultimate low carb pizza and easiest stuffed portabella recipe with only 4 ingredients and ready in 20 minutes! Preheat oven to 350 degrees and line a rimmed baking sheet with parchment paper or aluminum foil. Spread 1 tablespoon of marinara in each mushroom cap, top with a sprinkling of mozzarella cheese and a healthy dose of pepperoni. Top with more marinara and mozzarella. Bake for 10-12 minutes or until cheese is melted and bubbly. Remove and top with parsley. Serve hot. If you've tried this recipe, come back and let us know!